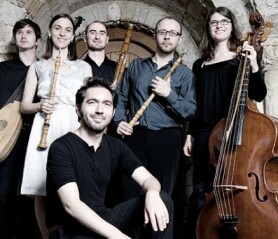 Formed in 2011 to explore the virtuoso wind music from the 18th century, the Edinburgh based Ensemble Marsyas counts amongst its members some of the finest historical instrumentalists working in Europe today. Ensemble Marsyas is devoted to exploring and championing the virtuoso wind music of the Baroque and Classical eras. The ensemble derives its name from Marsyas, the satyr of Greek mythology who excels in the playing of reed instruments and audaciously challenges Apollo, the god of music, to a musical contest to be judged by the muses. The core members, oboists Josep Domenech Lafont and Molly Marsh, cellist Sarah McMahon, Christine Sticher (violone), Thomas Dunford (theorbo) and Philippe Grisvard (harpsichord/organ), directed by bassoonist Peter Whelan, began their collaboration while studying in Basel and went on to perform with the European Union Baroque Orchestra. In 2007 they entered the Brugge International ‘Musica Antiqua’ Competition, where their performance of the music of Zelenka was awarded both first prize and the coveted audience prize. Ensemble Marsyas is now much in demand at prestigious festivals across Europe. Their debut disc for Linn of Zelenka Sonatas was awarded a Pizzicato Award and featured as BBC Music Magazine’s Chamber Choice, November 2012; in 2013 it was nominated for an ICMA award in the Best Baroque Instrumental Album category. They will release a further CD in June 2014, of music by Fasch, again on the Linn label.